Bingo Diamond is not a huge name in the online bingo world. We’re baffled why it isn’t better known though, as it’s a site offering a huge amount. You’ll find big bonuses, as well as loads of exciting games, plus the entire site looks and feels great. When you add the fact that the mobile offering is also a fantastic one, it’s clear to see that this under-rated site is actually one of the better bingo sites available in the UK. Want to find out more about Bingo Diamond? If so, why not take a look through our comprehensive review below? Okay, we have to be honest – the welcome bonus at Bingo Diamond isn’t the most spectacular you’ll ever see. You’ll get a 100% first deposit bonus worth up to £10, and that’s it. The wagering requirement is also pretty high, as it’s 50x. You’ll have two days to use your bonus funds, otherwise you’ll lose them. Despite this welcome bonus, we still think that, overall, the bonuses at this site are good. You’ll find different offers introduced on a regular basis, and many of these are worth a considerable amount of money. The rewards scheme is also a really good one, offering decent prizes to those who remain loyal to the site. Bingo Diamond looks fantastic. It has a bright purple design, which really pops from the screen when you first load the site, and the homepage features everything you could possibly need. You can scroll down the homepage and see the range of games on offer, meaning you don’t have to trawl through other sections of the site, plus they list the value of the progressive jackpots, which should get you excited. The site is also incredibly intuitive to use, making it simple to navigate your way around the different pages. Overall, we really like the look and feel of Bingo Diamond! Microgaming are having something of a resurgence in the online bingo world, and it’s their software you’ll find at Bingo Diamond. As you’d expect from the world’s biggest gambling software provider, the games are designed superbly and are incredibly easy to play, plus there are usually plenty of people around to make playing enjoyable. There is one room – the Broadway room – that is part of a different network though, namely the Broadway Gaming network. You’ll find that the game hosts are very good, plus players are very active when it comes to chatting. If you are a fan of mobile bingo, you’ll be fine at this site. This is because they have an extremely good mobile platform, offering plenty of bingo rooms and the same impressive prizes on offer to desktop players. There are no apps to download though, which could disappoint some, although we don’t think it’s a huge issue. There are five rooms in total at Bingo Diamond, with the most popular being the Broadway Room. This popularity is simply down to the fact that it usually has the biggest jackpot. You’ll be able to choose between 75-ball and 90-ball bingo when you play at Bingo Diamond, however there are no unusual forms of the game. If you’re in a rush, we’d recommend heading to the Speed room, which sees games played far more quickly – something that can really pump up the excitement levels. Games can be played at a variety of stakes, making this site great for players of all levels. One thing missing at Bingo Diamond is a free bingo room – something found at the majority of other online bingo sites. This omission means that new players won’t be able to learn the rules without risking their own cash. We’d encourage Bingo Diamond to add this feature as soon as they get the chance to. If you like slots, you’re going to love Bingo Diamond. In fact, it sometimes feels like they prioritise slots over their bingo games at this site! There are over 170 slots in total, which should be enough for most people, and many of them come from Microgaming. This means you’ll be able to play popular games like Immortal Romance and Thunderstruck II – games that have proven incredibly popular throughout the world. New slots are added regularly, ensuring that there’s always something new and exciting for even the most experienced players to enjoy. Looking for progressive jackpot slots? Well, you’re in luck when you play at Bingo Diamond. This is because they offer a number of progressive titles, including Mega Moolah, for you to play. You can’t see that there are progressive slots before you sign up with them, however take our word for it – they really are there! Bingo Diamond allow you to deposit using most of the common methods, namely VISA, MasterCard, Skrill, Neteller and Paysafecard. The only major options missing are PayPal and pay by mobile bill. The minimum deposit at this site is £10, which is slightly high for a bingo site, however there are no fees charged for adding money to your account. As you probably expect, any deposits are credited to your Bingo Diamond account instantly. All withdrawals must be made using your initial depositing option, unless you deposited using Paysafecard. The minimum withdrawal amount is £20, which is quite high. We think that it would be fairer to drop this down to the £10 mark. Withdrawals take around 48 hours to process, unless you’re asked to provide ID – something that only usually happens when a player is requesting a larger withdrawal. Withdrawals are free at this site. As we stated at the beginning of this review, Bingo Diamond isn’t the best-known bingo site around. We think that this is going to change though, as this site has many great points, including a nice selection of games and some really impressive prizes. Please also be assured that you’ll be incredibly safe at this site, as it is regulated by the UK Gambling Commission. 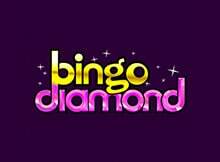 Now all you need to do is make your way over to the Bingo Diamond website, where you can sign up. You’ll then be having fun in a bingo room in no time at all! It is very easy to reach customer service via the homepage, through either live chat or via e-mail. The live chat is available 24 hours a day, 7 days a week.